The African striped mouse and the chipmunk develop dorsal stripes through a newly identified mechanism of coat color variation. African striped mouseJ.F. BROEKHUIS Laboratory mice come in a variety of colors, thanks to selective breeding, but in the wild, most mice are brown, according to biologist Ricardo Mallarino. The wild African striped mouse is a drab color too, but its coat also has a distinctive feature: alternating dark and light stripes down the middle of its back. Mallarino, a postdoc in the Harvard University lab of Hopi Hoekstra, and colleagues have now found that these stripes develop through a newly identified mechanism of varying pigmentation. Further, the African striped mouse (Rhabdomys pumilio) shares both the stripes and the mechanism with the Eastern chipmunk (Tamias striatus), the researchers report today (November 2) in Nature. Hoekstra is interested in how pigment patterns—like stripes—confer fitness advantages for mammals, as well as how these patterns evolved. Unlike lab mice, both African mice and chipmunks are active during the day. For that reason, “they’re really subject to predators that hunt visually as opposed to things that, you know, scurry around at night,” Hoekstra told The Scientist. Some scientists have suggested that stripes may help animals escape these keen-eyed predators, perhaps by making it more difficult for them to see where the animals begin and end, Hoekstra noted. In an attempt to understand not only why, but how striped rodents acquire these auspicious patterns, Hoekstra and colleagues compared the pigments and cell types present, as well as gene expression, within the tissues that make up the light and dark stripes. Researchers previously recognized that melanocytes, the cells that produce pigments that color hair, played a role. Mammalian melanocytes can produce two types of pigments—darker eumelanin and the lighter pheomelanin—and can switch from producing one type of pigment to the other, leading to strands of hair that change color from root to tip. If melanocytes are absent from a given area of skin, the hair will be white or light-colored (as is the case with the stomach of the tuxedo cat, for example), Hoekstra said. To determine which pigmentation mechanisms produced the rays of the African striped mouse, the researchers examined skin tissue—which includes hair and hair follicles—from each of the different colored stripes and found that, as expected, follicles within the dark stripes had higher melanin levels than those within the lighter stripes. Surprisingly, despite having less melanin, skin from the light stripes had just as many melanocytes as that from the darker stripes. Skin from the light stripes, however, did have lower levels of Mitf, a transcription factor that leads to the differentiation of melanocytes and production of pigmentation genes. 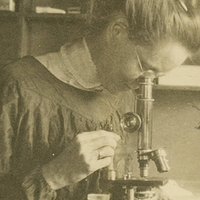 This led the researchers to hypothesize that in lighter stripes, low Mitf levels prevented the melanocytes from differentiating, producing melanin, and darkening the hairs there. 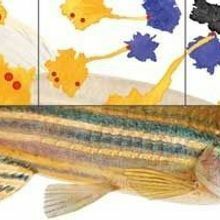 The researchers then used RNA-seq to compare gene expression in skin from the light and dark stripes, finding that skin from the light stripes showed higher levels of a gene called Alx3, a transcription factor previously known to be involved in craniofacial development. Both in cell culture and in developing mouse embryos, the researchers separately overexpressed and knocked down Alx3 using viral gene-delivery systems. The results of both experiments indicated that Alx3 downregulates Mitf. Further in vitro analyses revealed that Alx3 binds to and represses Mitf, the researchers reported. Next the researchers examined Alx3 expression patterns in the dorsal stripes of Eastern chipmunks the Harvard researchers caught in nearby Concord, Massachusetts, finding that Alx3 was also expressed in the chipmunks’ lighter stripes. 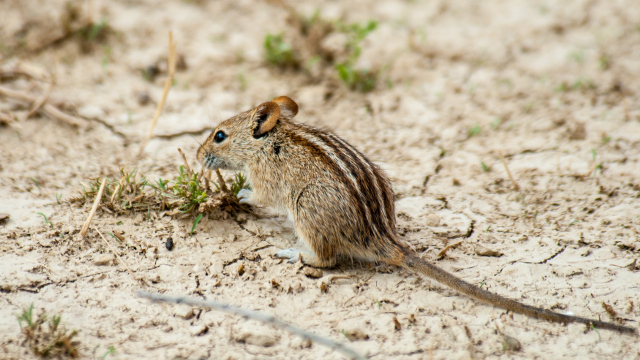 Despite their similar size and striped patterns, the chipmunks and African striped mice diverged from their shared evolutionary ancestor 70 million years ago, the authors wrote, proposing that dorsal striping evolved independently in the two rodents. Hoekstra said her team next intends to investigate the role Alx3 may play in creating stripes and other pigment patterns in other animals. R. Mallarino et al., “Developmental mechanisms of stripe patterns in rodents,” Nature, doi:10.1038/nature20109, 2016.